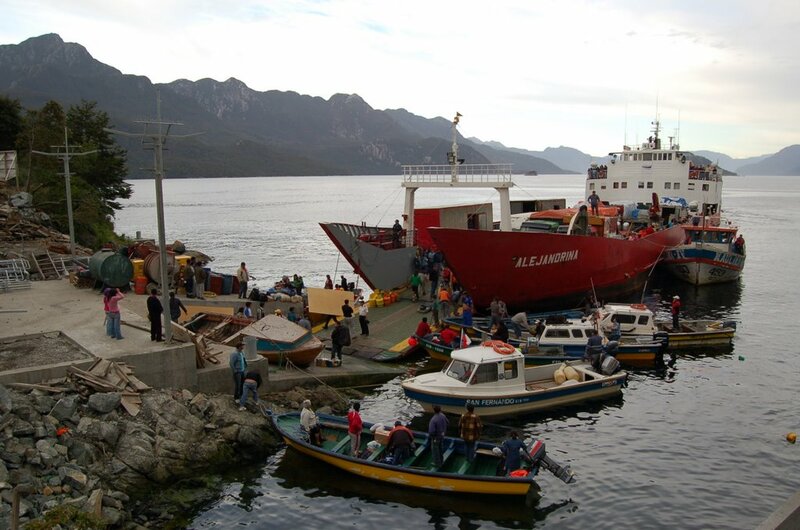 You won´t find it on any website or in any guidebook, but behind the blue door next to the ironmongers in the tin-shacked town of Castro is the office of Naviera Austral ferry company where, for the princely sum of eleven pounds, you can buy a ticket on the Alejandrina. 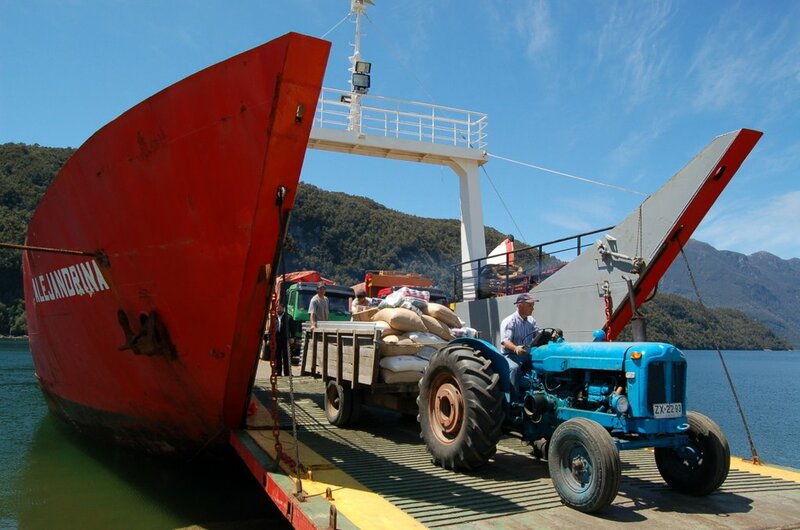 A converted freighter, she carries vehicles, supplies and passengers from the southern tip of Chiloé island through the fjords of southern Chile to the port of Chacabuco. A journey of 2 days and 2 nights. 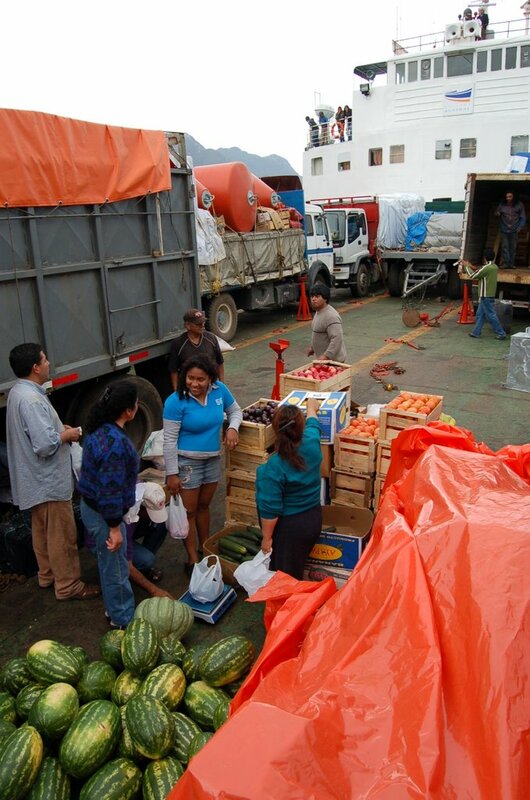 At the port, we watched bemused as the locals, young and old alike, sprinted up the ramp and onto the ship. It became apparent why they had done so when we boarded. The passenger accommodation consisted of a small cafeteria with a few tables, two televisions at full volume and the locals. The smokers and the ignorant found themselves on the canvas-covered rear deck. We spread out our sleeping mats and bags on a couple of benches, and settled down in our new home for the next 48 hours. 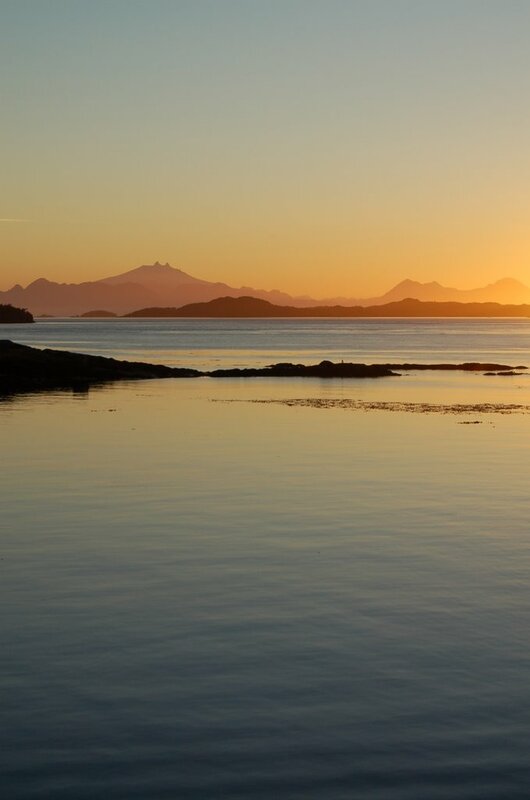 A group of men drinking whisky from beer cans cut into cups and excited families returning home or going to visit relatives meant that we slept little, but that we didwitness the 5 am dawn - the ridges of the multitudes of islands silhouetted against the warm orange light. A few hours later, we lowered the ramp onto a concrete slipway of a small village and vehicles took the men, workers on the salmon farms, to remote inlets and bays to feed Europe and North America. People trooped off into waiting boats, leaking oil and peeling paint, and disappeared with their families to God knows where. An old man and his kids sold fresh fruit from a trailer to locals - ripe plums, trays of peaches, kilos of deep red cherries and pregnant water melons. This pattern repeated itself as we chugged at a leisurely 9 knots in and out of the labyrinthe of islands, inlands and narrow straits. I wandered up to the bridge and, with no terrorists looking to bomb the ship or any of its destinations (for example, the carless island of Seno Gala - population 150), the captain showed me the radar, the GPS, the compass showing magnetic north (its direction varying according on the composition of the surrounding mountains) and the lever to steer the boat port and starboard. He laughed when I told him that I wouldn´t even be allowed to step on the bridge of a UK ferry and he suggested that I drive. And so, with the Alejandrina under my control, Captain Cooke finally re-entered the southern Pacific. Late on the second night, we reached Purto Cisnes, the first and only time before our final destination that our route would meet the carretera austral - the road built by Pinochet all the way down Chile to remind the Argentinians that he was watching them. The boat almost emptied and just us and a single tent, pitched forlornly under the strip light, remained on the rear deck. I slept like a log. Dawn on the second day brought clouded skies and the hint of rain, though the bridge´s barometer held a steady pressure. While Albane talked to a woman who had married her second husband only 30 days after meeting him, I spent a couple of hours with the captain who was just starting his 48 day shift. He had worked all over South America including Antarctica where we had witnessed a pod of 300 orcas, Easter Island and the Juan Fernandez islands where Alexander Selkirk spent 4 years before becoming the inspiration for Robinson Crusoe. 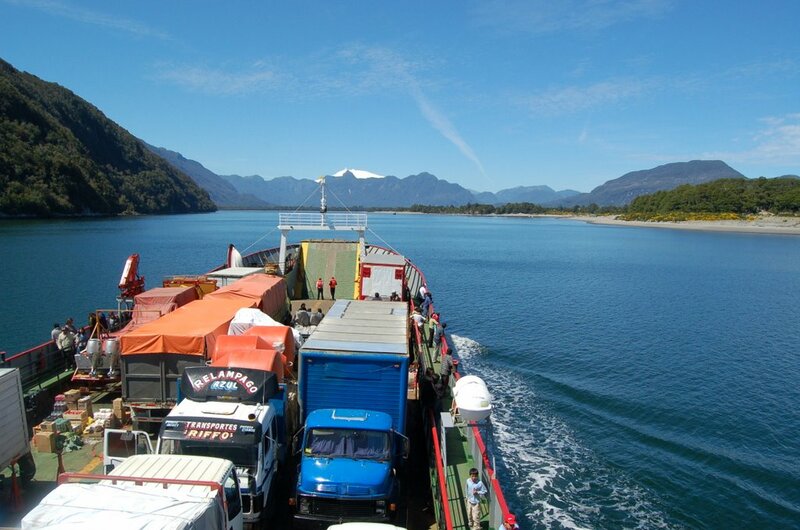 By late afternoon of the second day, we were travelling up the Aysen fjord towards our final stop. 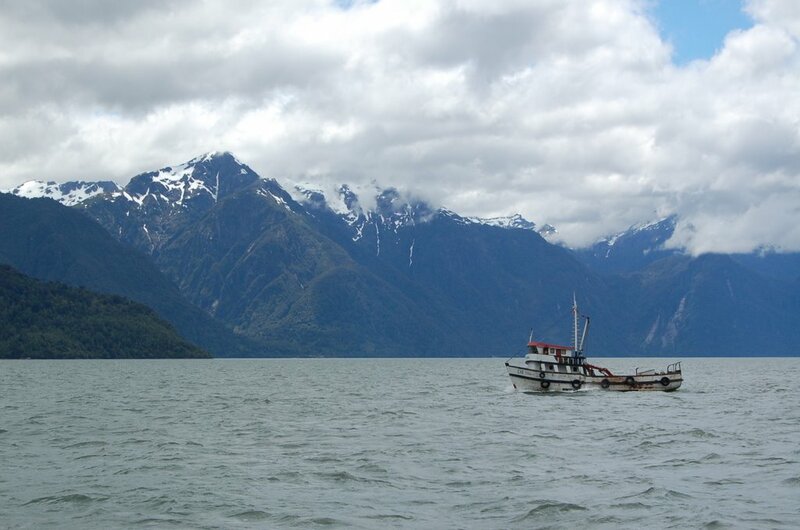 The trip had been a great experience - we had meet some interesting people, glimpsed the lives of those working and bringing up families in this remote region, watched dolphins and sea lions from the ship, and seen some of the most untouched landscapes of South America. We disembarked with a sense that it had been a privilege to travel the way that we had. Dry land felt like a new world.